Thermal Corporation transformed its work culture, with the help of the Anaar Roadmap, from finger-pointing and judging people to improving processes and involving people. All three major stakeholders – customers, shareholders and employees – benefitted; customers with better quality products and lower prices; shareholders with dramatically improved profits and a stronger company; and employees with a better compensation and generally a better place to work. Subsequently, Thermal received “Alabama US Senate Award for Productivity and Quality” and “Continuing Excellence Award”. Thermal Corporation is a manufacturer of industrial electrical heaters and temperature sensors for companies that produce products made out of plastics. The firm’s products are used on machines that mold, extrude or weld plastic products. The market niche of the firm is to provide very fast shipment of products that are based on standard designs, but custom-configured for dimensions and electrical specifications. The average order size is approximately 8 units at US$30 each. Current annual sales volume is about US$3 million. The company has 42 associates and is 27 years old. Thermal Corporation began life in 1969 as an industrial distributor. Manufacturing didn’t begin until 1977. An awareness of the importance of “quality” was there from the beginning of manufacturing, but the difficulties of just trying to figure out how to make things took priority over quality considerations. Efforts to improve quality consisted mainly of talking about it and making manufacturing people rework things that didn’t look good to sales people and managers. Sales growth averaged about 10% per year, and before-tax profits were very unpredictable, but averaged about 2%. There was, in the retrospective view of the president of Thermal, an unsatisfactory amount of finger-pointing among associates about problems and errors that would occur, and a retrospective judgment that he was among the worst of those doing the pointing and judging. Teamwork was not valued very highly; individual performance was emphasized. There was little thought given to the importance of the processes by which the work of the company was accomplished. Strong cultural barriers existed between the front office and the shop at the back of the building. The reports of success at companies using the teachings of Dr. W. Edwards Deming caused Thermal to send three senior people to a 4-day Deming seminar in 1985. They came back filled with enthusiasm and determined to convert the company to operations following the philosophy of Dr. Deming (the “14” points). Unfortunately, implementation of those principles was much more difficult than expected. To make a long story short, there were no significant changes in operations. Thermal heard of a local company, Disc Manufacturing Inc. (DMI), following the Anaar Roadmap approach to implementing TQM with considerable success. DMI referred Thermal to their consultant, J. Nirdosh Reddy of Anaar Company, and Thermal retained Mr. Reddy to help them get started. That was in August 1991, and that was when continuous improvement in operations really started. All of Thermal’s associates were given training in the Anaar Roadmap. Teams were formed for what were initially considered to be the most important processes and/or those in most urgent need of improvement. The company began changing its orientation from blaming people and personalities, to improving processes by which things are accomplished. Continuous improvement in processes became the goal, instead of trying to “improve people”, although there is still a substantial effort to encourage people to learn new skills. Of course, old attitudes and ways of doing business can’t be changed overnight, and all people are not equally amenable to adopting the new ways. However, things did start changing right from the beginning of the first training session. Some of the objective measurements and subjective judgments about improvements in performance are presented in the following section. One of the first processes to be addressed using TQM techniques was that of “financial control”. Improvements in that process resulted in making expenses and profits much more controllable and predictable, making life much more comfortable for all in the company that are concerned with financial matters. Improvements in order processing – front office as well as manufacturing processes – reduced reject and rework levels significantly. For example, while we needed to build 13 units to ship 10, now it takes only 11 which resulted in savings of material and labor. Cycle time reduction: During 1995, Thermal completed a “4-hour project” in which the facilities and processes were improved to enable many orders to be built and shipped within four hours after receipt of order. Orders not qualifying for 4-hour treatment were mostly shipped in less than six days. Prior to the project, standard shipping time was six days or more on most orders. Subjective, but very important, changes have also been observed since the beginning of the Anaar Roadmap journey in 1991. Customers have benefited with better quality products, better service and lower prices. Shareholders have been rewarded with dramatically improved profits and a stronger company. Associates are rewarded with better compensation through profit-sharing and an incentive bonus plan and a generally better place to work. 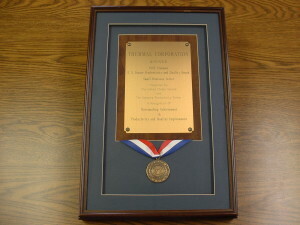 In 1993, Thermal received the prestigious “Alabama U.S. Senate Award for Productivity and Quality”. This award is based on the criteria for the Malcolm Baldrige award, but handled on a statewide basis instead of nationally. It entailed inspection and customer surveys made by a state quality agency. The same agency presented the company with a “Continuing Excellence Award” in 1995.